Moschino would certainly never be considered a shy brand, and with Jeremy Scott as creative director, the brand has become louder and louder, which is not a bad thing in the fashion industry. 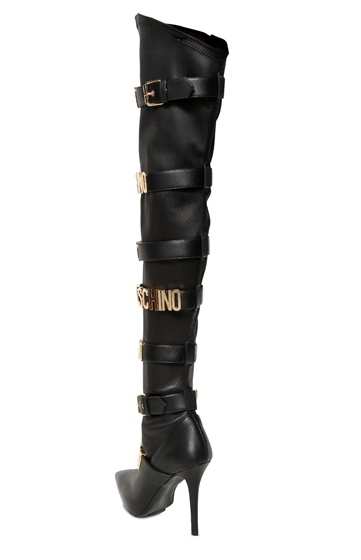 Check out these thigh-high leather boots with gold “Moschino” logo lettering emblazoned upon the buckles from Luisaviaroma. One thing is for sure: these are definitely attention getting. Two-thousand five-hundred and fifty-nine bucks says Rihanna will be rocking these within the next week or two. Would you wear these thigh-high boots? So many chic bags, so little time (and money…). We’ve gathered up the 5 top trending bags this season that are sure to make a statement. Enjoy! What do you think of these picks? Which are your favorite?